Vitamins, supplements and orthomolecular medicine. Your health and recovery are our goal. Our experienced team of providers are ready to start seeing you. Providing an array of nonsurgical techniques & treatments to get you out of back pain. We are a multidisciplinary practice with healthcare providers in the fields of General Medicine, Pain Services, Chiropractic Care, Nutrition and Physical Therapy. Our clinic has been servicing Whittier and the surrounding areas for over ten years. Our practice focus is mainly in the areas of musculoskeletal pain and disease and nutrition. We offer a variety of nonsurgical pain treatments for muscle and joint pains of the neck, back, knee, shoulder, elbow, and foot and ankle. We offer medical care and interventional pain treatments, physical therapy and rehabilitation, chiropractic spinal manipulation, bracing and supports as well diagnostic testing for your condition. We will create the correct treatment plan for you and begin alleviating your pain & improving your condition. We believe in an integrated team philosophy that fulfills the individual and unique needs of each patient. We treat the patient as an individual and will take into account your personal profile in treating your condition. Our experienced team of professionals have helped thousands of patients get out of pain and, also, avoid surgery. We have also helped many patients with rehabilitation to recover after necessary surgeries. In addition, we offer affordable nutrition programs promoting a healthy lifestyle which can prevent and even reverse chronic diseases. Best of all, we offer all these services under one roof! 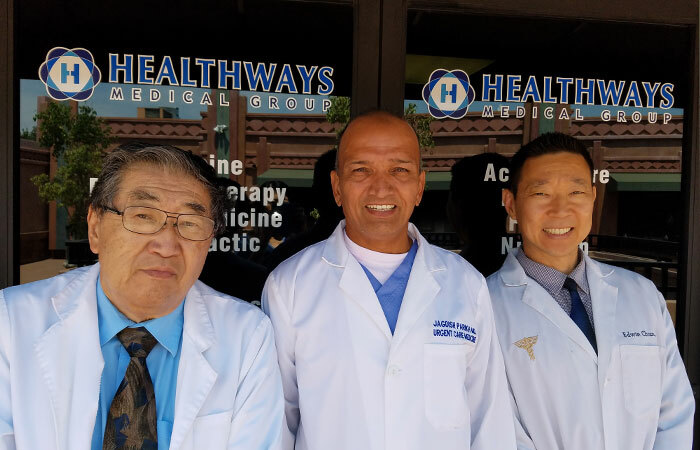 Dr. Edwin Chun of Healthways Medical Group has been practicing chiropractic for over 18 years. He has performed thousands of spinal adjustments and has treated a wide variety of patients from the elderly, patients before and after surgeries and pain services procedures, accidents, and regular healthy individuals seeking to stay well. Dr. Chun provides safe and effective treatment of many conditions of the spine including *low back pain, *arthritis (spondylosis), *herniated disc, *myofascial pain, *facet syndrome, and *scoliosis. If you're tired of suffering from an injury or chronic pain we are here to help. At Healthways Medical Group, our personalized care is carried out by healthcare professionals with 20 or more years of experience. Our providers and staff members are committed to compassionate care throughout your treatment. We strive to provide a friendly and stress-free environment that enables our patients to heal. We accept most PPO insurance plans, Medicare, Cash/Credit Cards, and accident cases on lien. Call us today to schedule an appointment or if you have any questions. 2018 © Swarm Interactive, Inc.